How is Everything in Egypt? A Status Report. That's a question that I am frequently asked. People in our neighborhood of Cairo say that things are calm but people need jobs. Well, that could be said of most large U.S. cities! We recently had a dinner guest from Cairo. He said that after the military deposed Morsi in June and took over the government, the gasoline supply immediately returned to normal - "like someone had just forgotten to turn on the tap!" Hmmmm. 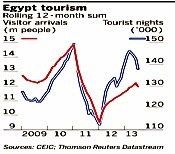 There is a very interesting article on Egyptian Tourism that was just published on the Financial Times (of London) website. It features Hisham Zaazou, Egypt's tourism minister for the past 14 months. He notes that the early part of these 14 months were spent combating many "Muslim Brotherhood" rumors. (Zaazou's) challenge was to convince potential visitors and international travel companies that the then-dominant Muslim Brotherhood had no plans to segregate men and women on beaches or to demolish the pyramids and Sphinx despite calls for such radical measures from some vocal Islamists outside official circles. after the military ousted Mohamed Morsi, the Brotherhood president, and embarked on a bloody crackdown which killed hundreds of his supporters, Mr Zaazou’s biggest hurdle is to persuade the outside world that Egypt is safe to visit. Since it is a twelve-month rolling total, it masks some of the decline in January of 2011 and this past June. Still, the totals for 2012 exceed anything I would have guessed. However, the article notes that seventy per cent of the business in recent years has been in the Red Sea and the Southern Sinai, areas that never saw much in the way of demonstrations. This explains why the huge fall-off in tourist volume that we saw wasn't reflected in the official statistics. Zaazou goes on to note that street fighting between police and demonstrators in Cairo has scared away visitors to the capital and all but destroyed cultural tourism centred on the Pharaonic monuments. 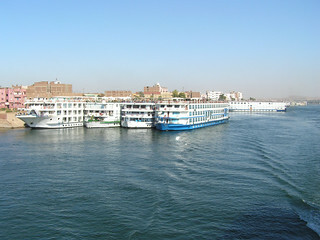 In particular, the Nile cruise ships that ply the waters between Luxor and Aswan in the south now have just 4% occupancy. We are used to seeing them filled with passengers and lined up like this. Zaazou is planning to arrange flights directly from Germany to Luxor to boost this business. Egyptians have always separated their love of Americans from their disdain for our government's foreign policy. Convincing most Americans that the Egyptian people won't feel the same outrage toward them that is held toward President Obama and Ambassador Patterson will be a tough sell. But, we certainly hope to be back in Cairo in January. Keep reading this blog for reports!